Schematic of the hybrid solid-state composite electrolyte, where ceramic garnet nanofibers function as the reinforcement and lithium-ion–conducting polymer functions as the matrix. The interwelded garnet nanofiber network provides a continuous ion-conducting pathway in the electrolyte membrane. 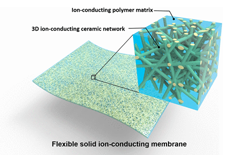 UMD researchers have developed, for the first time, a flexible, solid-state, ion-conducting membrane based on a 3D Li-ion conducting ceramic nanofiber network. High capacity, high safety, and long lifespan are three of the most important key factors to developing rechargeable lithium batteries for applications including portable electronics and electrical vehicles. To develop a safer, higher performing lithium-ion battery, the membrane shows superior thermal stability and electrochemical stability to high voltage, and can replace conventional flammable organic liquid electrolyte systems in lithium-ion batteries. The full article, “Flexible, solid-state, ion-conducting membrane with 3D garnet nanofiber networks for lithium batteries” was published online last week in the Proceeding of the National Academy of Sciences (PNAS). The research is also featured in NanotechWeb.org, a website from the UK Institute of Physics.